While the NBA world continues to dissect what’s wrong with the Cleveland Cavaliers, the Charlotte Hornets are quietly the biggest disappointment in the Eastern Conference. Charlotte is 4-12. They have lost seven in a row, and nine out of their last 10. The most worrying part of their slow start is what’s going on with Lance Stephenson. 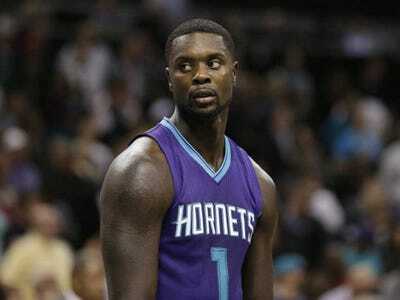 The Hornets signed Stephenson to a three-year, $US27-million contract this summer. He was supposed to give the team some much-needed wing scoring and bolster a defensive unit that was already ranked 5th in 2013. Hornets owner Michael Jordan even described him as a LeBron-stopper in a preseason interview. Stephenson is a mess right now. He’s averaging fewer than 10 points per game and shooting an abysmal 37% from the field (including 20% from 3-point range). One NBA scout called him out of shape. To make matters worse, there’s now a report that Stephenson was the reason for Roy Hibbert’s perplexing late-season slump last year in Indiana. Was told a few weeks ago Lance Stephenson, not Paul George or anyone else, impacted Hibbert so negatively last season. Looking accurate. Also told me that, from the start, folks in Charlotte started to realise in Lance they’d bitten off more than they’d planned on chewing. Charlotte’s big problem has been on defence. They were 5th in the NBA in defensive efficiency last year, but have fallen to 21st this year.